Madelyn served with La Comunidad Sagrada Familia as a TFI fellow. In the summer of 2017, I worked with La Comunidad Sagrada Familia as a TFI fellow. Sagrada Familia is an orphanage school that houses children and teenagers who cannot live at home due to family and or financial problems, or who have been abandoned at an early age. This organization works hard every day to serve its children and to provide them with the opportunities they need for a better future. 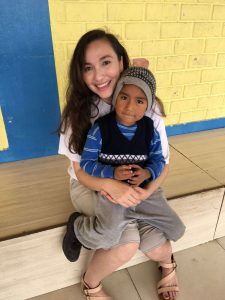 I spent two months working with Sagrada Familia, my days consisted of working in the baby dorm in the mornings and teaching English classes to high school students in the afternoons. Evenings I would grade English homework and prepare lesson plans for the following day. Every two weeks I would assist with buying and replenishing food for the orphanage by going to the local market and delivering it back to Sagrada Familia. During my time there, I got very close to the children and faculty. Waking up every morning and getting to see the children’s smiling faces and receiving their warm hugs was a true privilege; they make you never want to go back home. A typical day consisted of waking up at 7am to help care for infants and toddlers in the baby dorm. I was responsible for feeding, changing, and putting the children to sleep. I also helped sweep, mop, and wash dishes every morning and night. In the afternoons between 3:30pm and 5pm, I would teach English to the older students and review material from previous classes. After class I would tutor kids and provide extra help with English homework to those who wanted it. In the evenings I would return to the baby dorm and assist with cleaning the area in order to have it ready for the children the next day. I would then return to my room and correct the homework my students have given me and researched different classroom activities to add to my lesson plan for the following day. Every two weeks I would assist with replenishing the food for the orphanage by getting up at 5am to travel to the market to buy and carry giant bulks of food to be cooked for the entire community. Trips to the market were at times overwhelming but I felt satisfied at the end of the morning to see an abundance of nutritious food being brought to Sagrada Familia. Working with the children was an honor and hearing about their lives and personal stories was a huge inspiration. These children are strong, resilient, and very intelligent. They deserve every right and opportunity for a brighter future. They love and support each other as a community and a family and I feel extremely fortunate to have been able to be a part of their community. This experience only reinforced the desire I already had to contribute to this type of work and to continue making a global impact. I recommend this opportunity to anyone with an open mind, heart, and hardworking spirit.